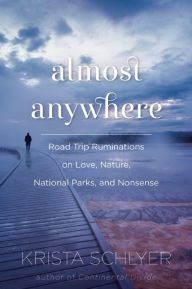 Almost Anywhere tells the story of three people: the author Krista Schlyer, her husband Daniel, and their friend Bill. When Daniel passes away unexpectedly from cancer, Krista and Bill set out on a cross-country journey, exploring national parks and monuments along the way. My interest in the book was with the national parks angle. Having spent the last two vacations exploring the wonders of Yellowstone, I was eager to learn more about some of the other national parks. Krista and her friend Bill do cover a lot of territory in a year and a half, with the author providing a bit of background and history with each stop. Krista’s memoir alternates between her time with her husband and her time with Bill and their journey together. Some of the best scenes in the book involve Krista’s dog Maggie, who accompanies them on their trip. Maggie provides comic relief throughout. My three-star rating is due primarily to the lack of structure. There isn’t a beginning, middle, and end. There’s a beginning and then a lot of aimless wandering. Another negative for me was the lack of images and the lack of a map showing their many stops. Krista is a photographer. Both she and Bill took many pictures during their journey. Why not include them? I read the eBook version and listened to the audiobook. It’s possible that the printed version had the images and map that was missing in the eBook. If so, then my complaint is with the publisher and not the author.